This ancient volcano has three incredible Summits and it’s the highest mountain in Nahuel Huapi National Park. 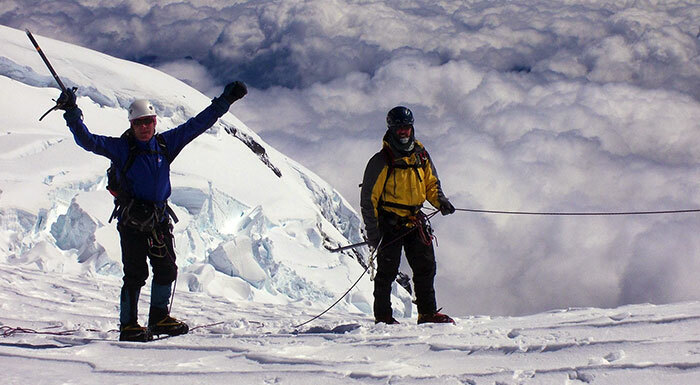 Its International Summit is almost 3484 mts, The Chilean 3262 mts and Argentine summits a little lower, roughly 3187. Day 1, Hike up to Meiling Mountain Hut. 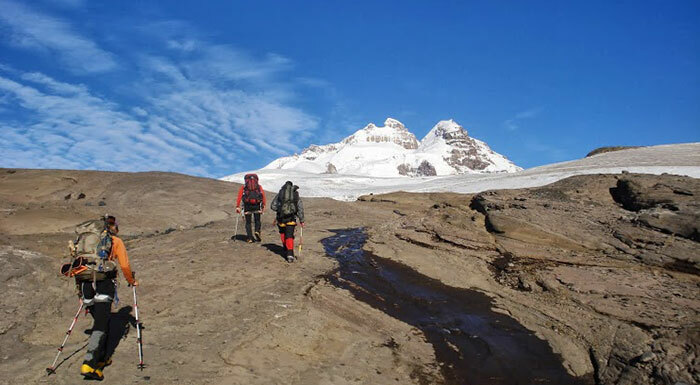 Your ascent starts at Pampa Linda, meaning “beautiful meadow” with amazing views of the whole mountain.The trail begins easy through the native forest, soon crossing Castaño Overa river, an outflow of one of the Glaciers calving off the mountain. The trail climbs gently for a couple of hours. As you gradually gain elevation, beautiful views appear as you reach the shoulder and soon you are above the tree line. Once on bare volcanic rock continue ascending up the ridge towards Meiling Hut at 1930mts. 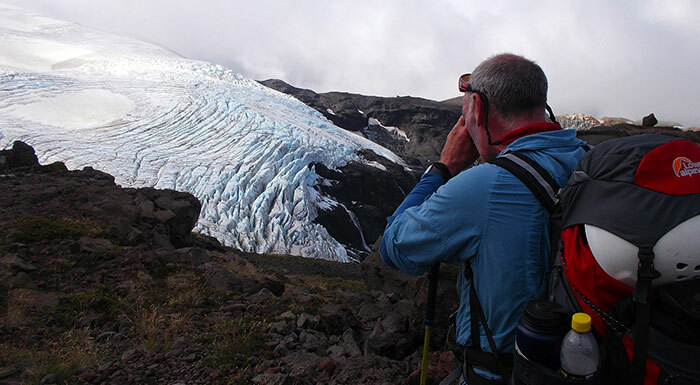 Relax and enjoy the incredible views of the glaciers flowing down either side. 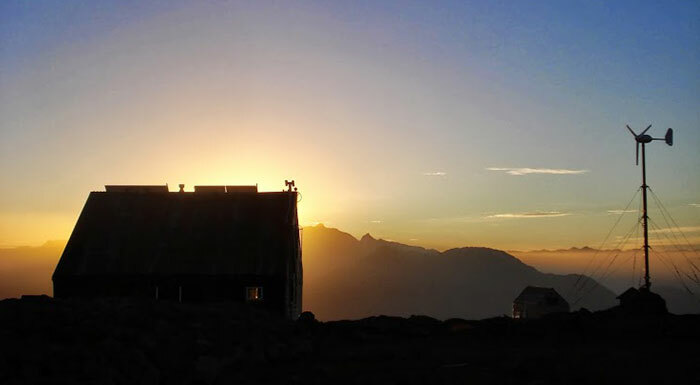 Average time up to the hut is 5 hours. Before dinner we´ll go through some of basics of “glacier travel”, crevasse rescue and the plan for the summit day. Early dinner and of to bed. Day 2, Summit attempt: Alpine start at 4 am for breakfast. Once you are ready and all gear packed, the ascend begins. Headlamps on, the night is cold but the energy is high filled with excitment. The route follows a rocky ridge and once you rich the glacier is time to rope-up. The average slope is quite mellow with a few stepper parts, till you reach the Col between the Argentine and International peak. Up to here its an average of 4 to 6hs depending on the glaciers conditions, snow bridges, crevasses, etc. The climb is slow but steady, crossing crevasses and rappeling a snowy ridge with a big crevass. Then navigate through some more crevasse fields and gain the saddle. This is a good spot to rest and reasses if the energy and conditions are good to continue to the summit. The last climb to the summit is a little steeper and conditions can vary a lot depending on the weather through out the summer. There is a last short climb, only a couple of meters and we are on the summit. After taking in all the surrounding beauty its time to head back to the hut and enjoy a well deserved dinner and celebration. Round trip is around 12hours give or take. Roughly 10km one way and 1300mts elevation gain. Day 3, Descend back to Pampa Linda: Well rest slow morning, enjoying the fly of Condors close by and views of the glaciers close to the hut. Before mid-day the descend starts following the same trail you used to climb up. In a much relax mood, take the time to appreciate your achievement and absorb the beauty of the mountains and it´s wilderness. After 4 hours you will arrive back to Pampa Linda where a cold beer and a grassy meadow will be waiting for you to rest and stretch before you begin the return back to Bariloche city. 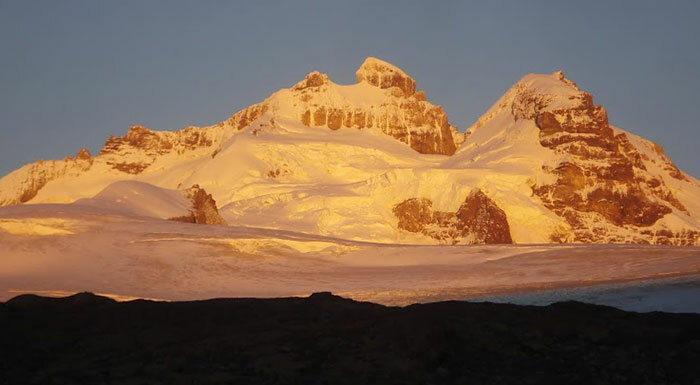 Optional: Extend the peak ascent expedition two more days with a traverse down Alerce glacier towards Paso de las Nubes, spend a night at Rocca hut and then descend towards Pampa Linda or explore beautiful Frias valley and get back to Bariloche by catamaran from Puerto Blest.